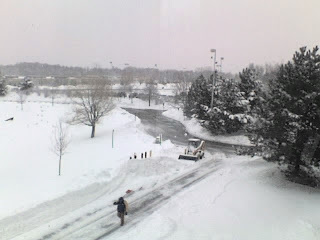 As you can see in this picture, taken out a window here at work, it is snowing again. But, in just three days, I will be trading views like this for views from the deck of a cruise ship. On Friday, Georgia and I will be headed for the Caribbean and south Florida. I am really looking forward to the warm weather. By this time of year, I have had enough of winter. We will be taking a 5 day cruise to Jamaica and Grand Cayman then spending a couple extra days in Fort Lauderdale and Miami. I will make a full report when we return. Have a safe trip! Let us know if you do any flying while you are down “on the sunny side”. I’m jealous – have a nice trip!